Are you looking for a magician in Nottingham, Derby, Leicester or anywhere in the UK? Are you wanting for a magician for your wedding? Steve Gee performs some of the most visual magic you would have ever seen. He has quickly established himself as one of the UK’s leading visual magicians. His eye-popping magic is the kind of magic you would have seen on TV! Steve’s act is perfect, not just for weddings but also corporate events and private parties. 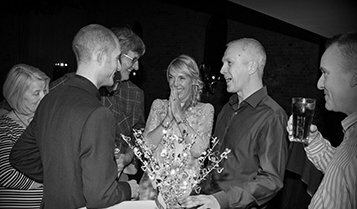 To get a small taster of the kind of mind-blowing magic Steve can be performing at your wedding in Nottingham, Birmingham, Leicester or Derby check out the video below. To check Steve’s availability get in touch using the contact form below or give Duncan a call who helps manages Steve’s very busy performing schedule. If you are looking for another form of visual magic you could consider Duncan’s digital magic act too. When is the best time to hire Steve as your wedding magician? Hiring a Wedding Magician whilst you guys are having their photos taken is one of the most popular times to have your guests entertained. Whilst you guys are having your photos taken, more often than not, the other guests make find themselves twiddling their thumbs in between nibbling finger food and sipping bubbly. 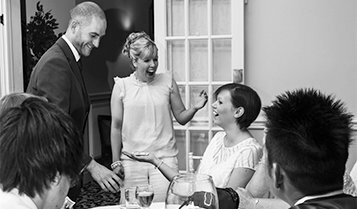 To really get the conversations started and keep your guests in high spirits, booking a magician to mix and mingle with your guests is a unique wedding entertainment idea which is guaranteed to leave your guests laughing in amazement. The first meal of your married life is always a special and memorable one. What better way to make your wedding breakfast even more unique and fun than booking a magician for weddings to complement and enhance the speeches, food and beautiful surroundings? 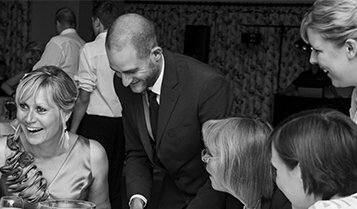 Steve can mix and mingle between guests to perform as a table magician or he can also offer his cabaret act which ranges between 5 and 45 minutes in length. This act is highly engaging and hyper-visual with a family friendly feel to it. Hire Steve as to perform magic in Nottingham, Derby, Leicester or Birmingham. Are you looking for something unique to rock your evening entertainment? The evening entertainment is the most popular time to book any form of wedding entertainment so hiring the magic and mind-reading skills of Steve may be the perfect solution if you are looking for something hard-hitting, unique and contemporary!!. Be it as a mix and mingle or table magician style or cabaret style. Steve can work alongside background music and is the perfect tonic to get the conversation flowing with your new evening guests and make them feel welcomed into the special day. Steve was simply fantastic at our special day. All ages loved him and his skills. Hopefully we’ll see him at another wedding. We booked the Steve via a recommendation from Duncan and he went down an absolute storm! Superb magic and great for the whole family! 100% recommended! Check out some of his videos for a taster of his work. We searched high and low for something unique for our special day. We stumbled across Steve through a recommendation from Duncan and he disappoint. We would certainly be recommending him too. 10 out of 10. We are still trying to figure out how your produced those lollipops!. Incredible magic! You are better than Dynamo!